UHV students prepare to make their processional entrance into one of the December commencement ceremonies at Faith Family Church. Close to 385 University of Houston-Victoria students are expected to participate in two commencement ceremonies on Saturday, listen to words of wisdom, and sing the university’s new alma mater for the first time during graduation. 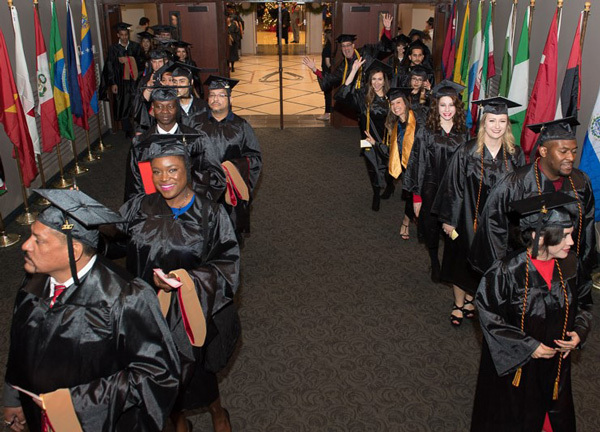 UHV will hold spring commencement Saturday at Faith Family Church, 2002 E. Mockingbird Lane. The 9 a.m. ceremony will be for graduates of the schools of Arts & Sciences and Education, Health Professions & Human Development. The 1 p.m. ceremony will be for graduates of the School of Business Administration. Paula Mendoza, who recently was elected secretary of the UH System Board of Regents, will bring greetings during the morning ceremony on behalf of the board. Student Regent Neel Mutyala will bring greetings during the afternoon ceremony on behalf of the board. 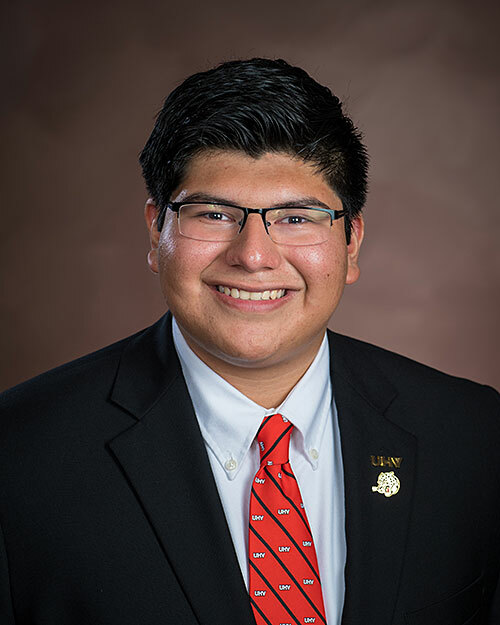 Alvaro De La Cruz, UHV Student Government Association president, will lead the moment of silence. 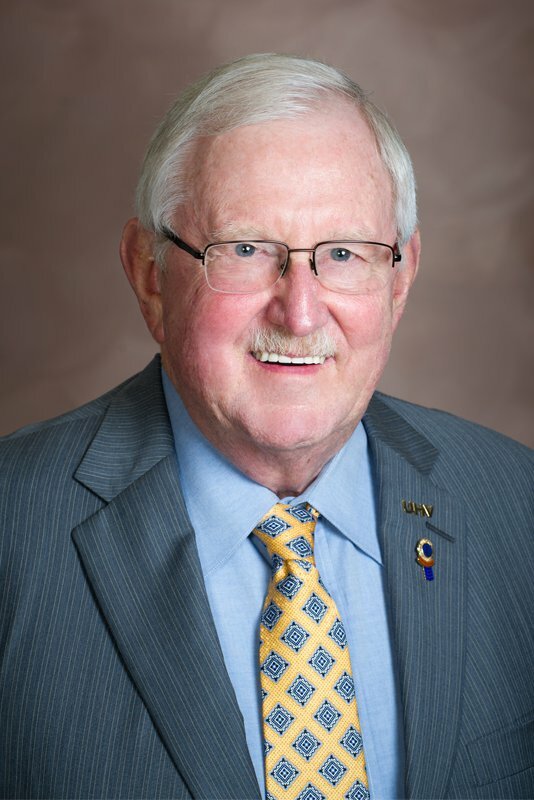 Joseph Ben-Ur, UHV Faculty Senate president and professor of marketing in the School of Business Administration, will serve as grand marshal of the ceremony, and Camilla Sutton, UHV Staff Council chair, will give the welcome. Morgan will confer the degrees, and the deans of each of the university’s three schools will certify that students have completed their degrees. The outstanding students for the spring semester will be recognized by David Cockrum, interim provost and vice president for academic affairs, along with faculty members receiving awards for excellence in teaching, research and service. A live-streaming broadcast of the ceremonies will be available at www.uhv.edu/graduation. The university’s new school song will be included in both commencements for the first time in UHV’s 45-year history. The school song recently was revealed during an event at UHV Pyramid Row. UHV junior Cassie Cameron will lead in singing the alma mater, and attendees will join her to sing the song a second time. This will be the first group of students to graduate and sing their alma mater during commencement. For general information about UHV commencement, contact special events coordinator Nancy Gresham at 361-570-4351 or greshamn@uhv.edu. Students who have graduation questions should contact UHV Student Life & Services at 361-485-4411. UHV will hold an event the day before commencement. The UHV International Student Sash Ceremony will start at 3 p.m. Friday in the UHV University North Walker Auditorium. The university will present graduating international students with a sash from their country of citizenship. The students will wear the sashes at commencement.